No other species of Vespidae has mostly orange antennae. The European paper wasp is a generally black insect marked with yellow. They are fairly slender-bodied insects with a distinct constriction of the body between the thorax and abdomen. The European paper wasp is superficially similar to and commonly mistaken for various yellowjackets (Vespula spp.). Adults feed larvae chewed-up pieces of caterpillars and other arthropods. The adults, like other paper wasps, feed on nectar from flowers and other sugary liquids. Only females are able to overwinter. Some workers of previous season are able to survive and act as auxiliary females for the foundresses, provided the quiescent phase has been short enough. An introduced species from Eurasia, often mistaken for a yellow jacket. First reported in North America by G.C. Eickwort in 1978 near Boston, Massachusetts. There are reports of it replacing native species of wasps in some areas. This phenomenon is occurring in the San Francisco Bay Area. European paper wasps do not produce nuisance problems around outdoor dining however they can sting. 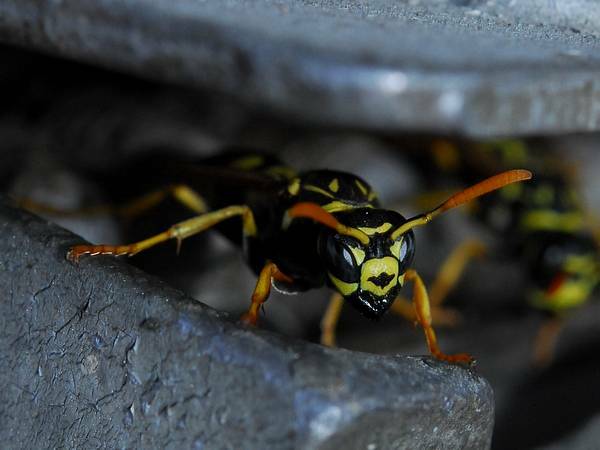 European paper wasps have become one of the most important natural controls of many kinds of yard and garden insects. The European paper wasp is a social insect that produces an annual colony in a paper nest. Individual colonies are established anew each spring.